Once you set up your Into Film Club, you can browse our extensive catalogue and begin selecting the perfect films for your club members to enjoy. To choose DVDs to order, browse our catalogue and add films to your order list. We’ll send you a maximum of two from your list as soon as possible. Screen and enjoy the films you've chosen. We ask that you return DVDs within six weeks so that other Into Film Clubs can enjoy them after you. Return your DVDs to us in the FREEPOST envelopes provided, and you'll be sent more films from your list. You must make sure your Into Film Agreement form has been signed by your Head and sent back to Into Film in order to receive films. You can complete the form once you’ve started an Into Film Club. Search and browse for films on our catalogue, then use the "order" button to add to your order list. We will then send a maximum of two titles from your list as soon as possible. After watching and enjoying the film, DVDs should be returned to us within six weeks as per our returns policy. Your club members can add films to their wishlist which helps inform the films you select. So don't forget to visit the wishlist area, and see if any of their suggestions are suitable for your order list. Some of the films in the Into Film catalogue are new releases and not available to order. You can find out more in our FAQs, however your club members can still review them if they’ve watched in the cinema. Interested in running an Into Film Club but still not sure? This page will give you more information about what's involved. Why set up an Into Film Club? 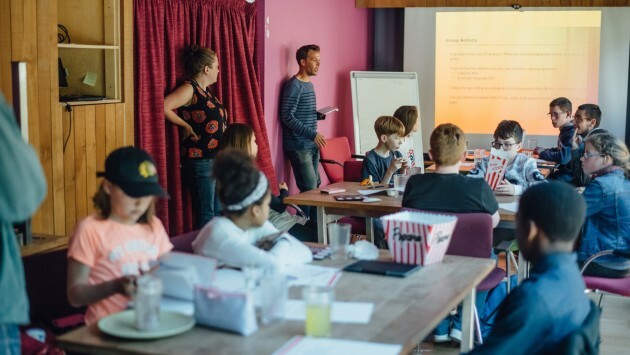 Learn about the positive impacts Into Film Clubs has on young people. Inspire young people to enter our Review of the Week competition.